On Friday 11th May, The Grocer’s 2018 Own Label Awards were held at the London Hilton, Park Lane. The purpose of these awards highlights the contest of the UK’s best and most innovative Own Label products. Over 1,000 products were entered before the two-stage judging process whittled it down to just 350 product finalists. On the night, the winners were announced by Adam Leyland, editor of The Grocer, and TV presenter Stacey Solomon. 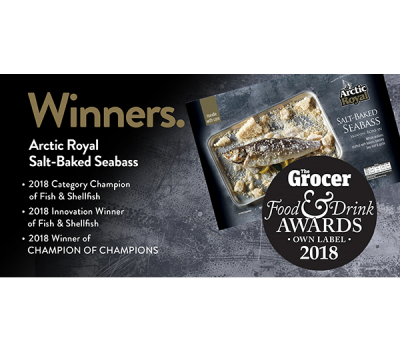 We are beyond proud to say that our Arctic Royal Salt Baked Seabass wowed enough to win 3 awards on the night; including one of the further three special awards that were not category specific. 2018 Category Champion of Fish & Shellfish – Iceland Arctic Royal Salt-Baked Seabass, Sykes Seafood. 2018 Innovation Winner of Fish & Shellfish – Iceland Arctic Royal Salt-Baked Seabass, Sykes Seafood. 2018 Winner of CHAMPION OF CHAMPIONS – Iceland Arctic Royal Salt-Baked Seabass, Sykes Seafood. ‘Iceland’s Arctic Royal Salt Baked Seabass beat all of the category winners to crowned Champion of Champions after delivering “real wow factor” for consumers and experts alike’. – The Grocer (read more at https://www.thegrocer.co.uk/events/the-grocer-own-label-food-and-drink-awards/iceland-triumphs-at-the-grocer-own-label-awards-2018/566982.article). Everyone at Sykes would like to this opportunity to thank all those involved in the success of our Arctic Royal Salt Baked Seabass triumph. So much so, that we are already preparing and planning for the 2019 Own Label Awards possibilities.